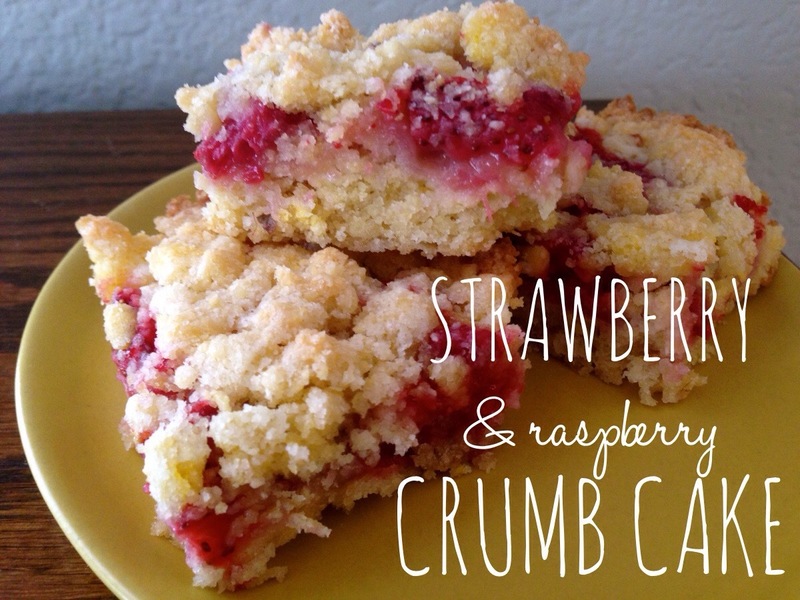 Strawberry & Raspberry Crumb Cake… – You Betcha Can Make This! I am loving the fact that I’m at the point where I’m not afraid to experiment with recipes or afraid to make changes in them if something just doesn’t look right. And that is the story of this recipe. I had some strawberries that were in my refrigerator for a while and I wanted to use them before they went bad. 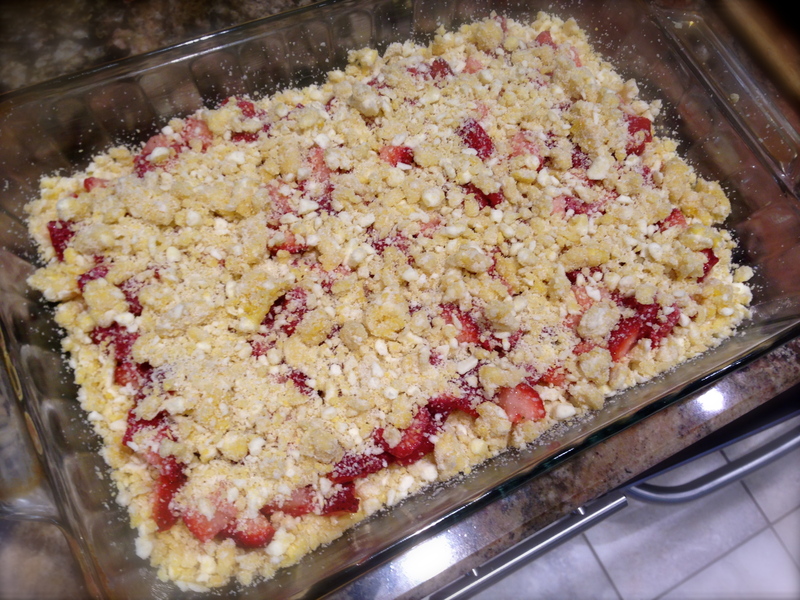 So I started researching recipes and found one for strawberry crumb bars. I basically had all of the ingredients so I decided to try the recipe. 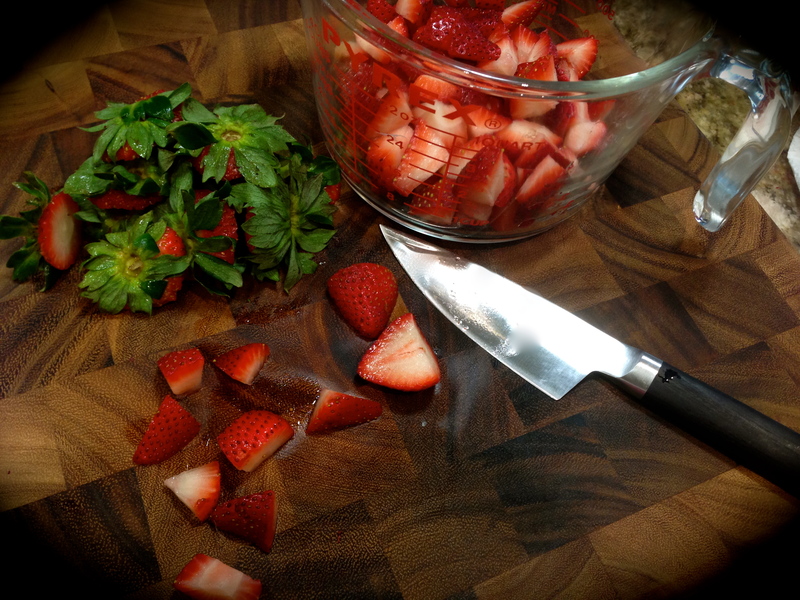 The original recipe called for 4 cups of chopped strawberries. After chopping up what I had I found I only had 3 cups. My initial thought was to go to the store to get more strawberries. Then I remembered I had a container of raspberries in the refrigerator as well. So I thought, maybe I’ll just chop those up and combine the two berries. Now this may sound silly, but this was a big leap for me. In the past I’ve not been one to stray from recipes or tweak them in any way. But I thought, what the heck. I cooked with raspberries before. What harm could it do to combine the two. And so I did. Lesson Learned 1 – Trust Your Gut: As I mentioned earlier I would always follow recipes to the letter and never deviate even if something did not look right. Now I have to put in a big caveat here. Baking is very different from cooking. Your chances of making a mistake when playing around with the ingredients when baking are much higher but in this case, especially with the crust/crumble, I knew that if the dough did not somewhat stick together when I squeezed it, it would not produce the desired results. But I was also careful. I only added in one beaten egg at a time and with the third egg I put it in a little at a time just to make sure that I wasn’t adding too much. My advice on this recipe is to use two extra large to jumbo sized eggs or three regular sized eggs. Don’t dump them in all together. Put them in one at a time and check the consistency of the dough before you add more. Once the dough somewhat sticks together when you squeeze it, you’re done. 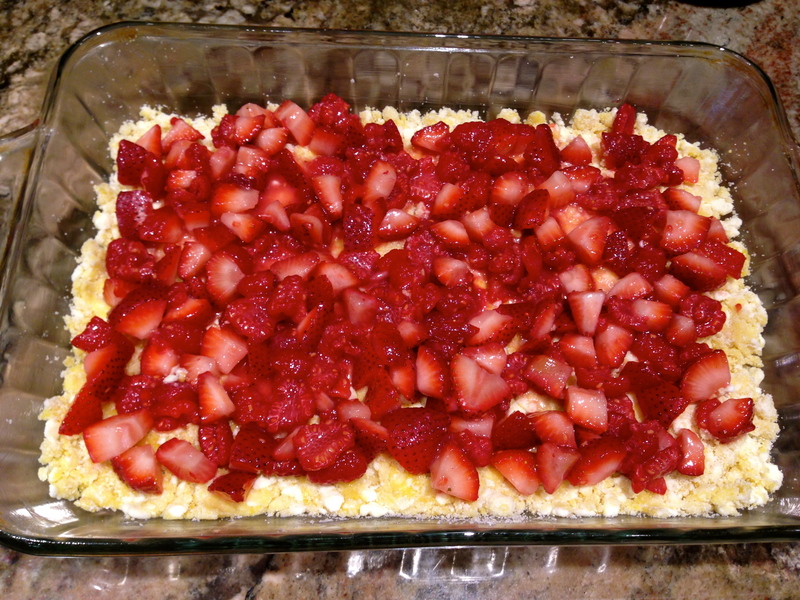 Lesson Learned 2 – This Recipe Can Be Made With Various Berry Combinations: In my case it was strawberries and raspberries but you can make this with raspberries and blueberries or strawberries and blueberries or blackberries and strawberries or whatever combination of berries you have on hand that can be baked. Just make sure you have four cups of berries because you’ll need that amount to adequately cover the top of the cake. Also make sure to try to cut the berries into equal sized pieces. And use caution when combining them with the sugar and cornstarch. Use a folding technique rather than a stirring technique so you don’t overly bruise or rip apart the berries. 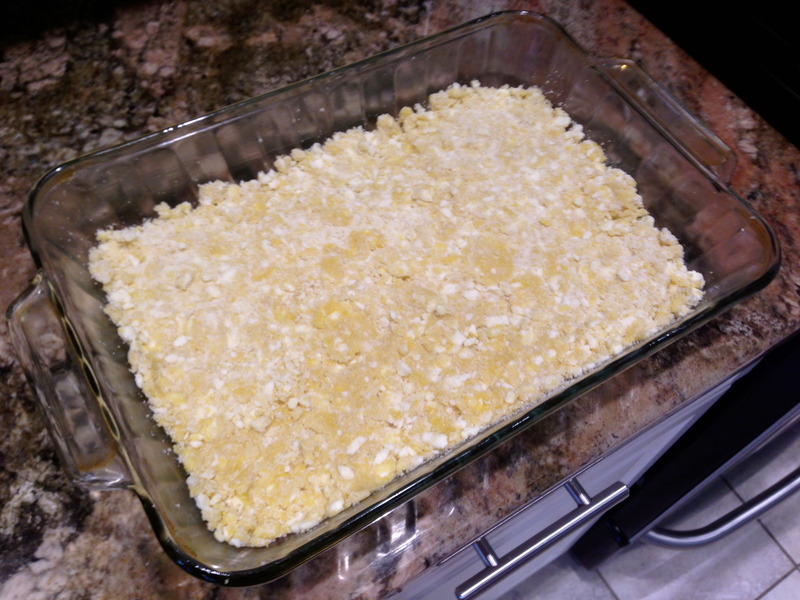 Lesson Learned 3 – The Importance of Using Cold Butter: In order to get a flaky crumb crust/crumble the butter needs to be very cold when mixing it with the dry ingredients. Many recipes will tell you to use a pastry cutter or two knives and cut the butter into the dry mixture until the butter is a pea-shaped size. I never seem to have any luck with that process so what I did was put the dry ingredients in a food processor add the cold butter pieces and pulse all of it together to get the consistency you see in the picture to the right. Two things to keep in mind – 1: Cut the butter the very first thing and put it back into the refrigerator while you prepare the berries and dry ingredients. That way the butter will be as cold as it can possibly be when you cut it into the dry ingredients. 2: If using a food processor to incorporate the butter, hold a towel over the opening so that as you pulse you don’t get a cloud of flour coming out the top of your food processor. Other than these few lessons learned this recipe couldn’t be easier to make and the end result is one truly delicious crumb cake. Enjoy! Preheat the oven to 375. Grease 9 x 13 pan and set aside. Put the flour, sugar, baking powder and salt into a food processor. Hold a towel over the opening of the processor and pulse to combine. Add the cold butter pieces and pulse the mixture until the butter is the size of peas. Remove the mixture from the food processor and put into a large bowl. 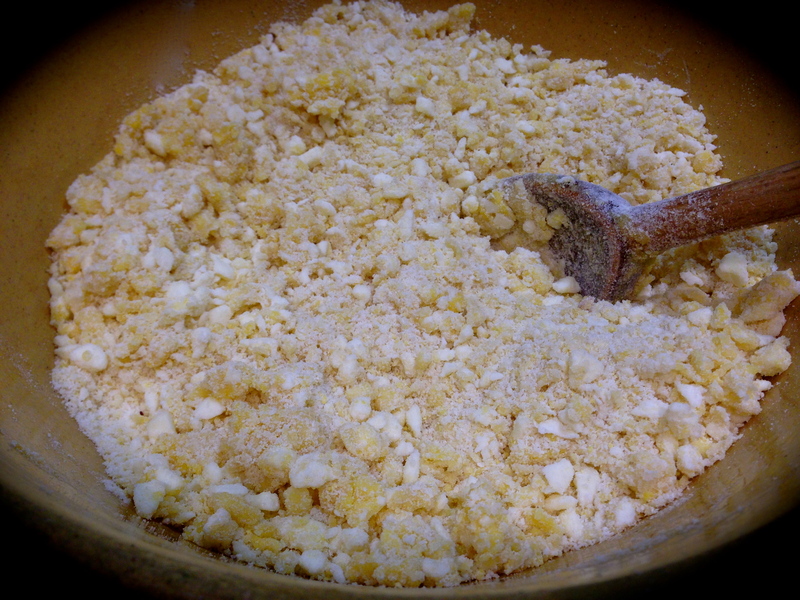 Add a beaten egg one at a time and stir it into the mixture. (If the consistency is correct after adding two eggs, don’t add a third). The dough is of the right consistency if it sticks together when you take a handful and squeeze it. Take half of the dough and put it in the bottom of the prepared pan and pat it down. Carefully fold together the berries, sugar and cornstarch. Spread berries on top of the dough. 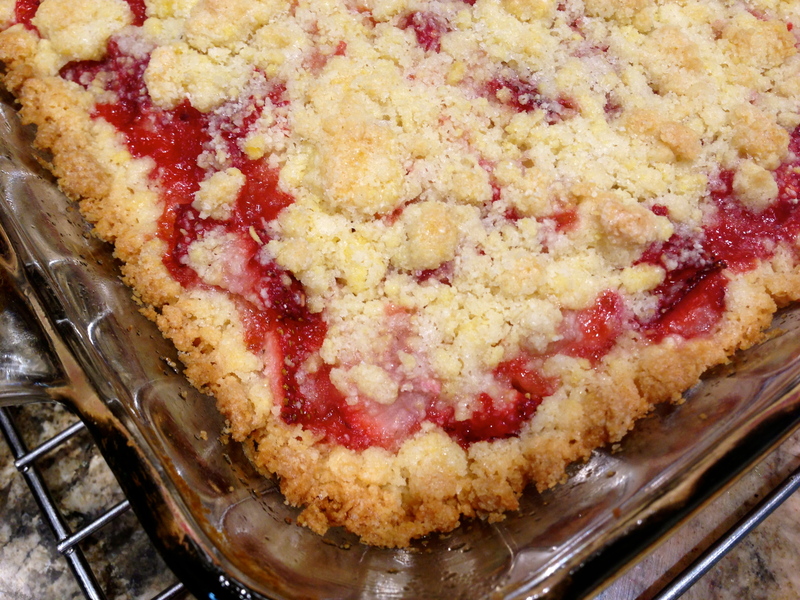 Crumble the remaining dough on top of the berries. Bake for 45 – 50 minutes. Let cake cool before slicing. Thank you, I appreciate that. Try the recipe – like you said, it has Spring written all over it! Unauthorized use and/or duplication of material (including images) on this website without express and written permission from this blog’s owner is strictly prohibited. Excerpts and links may be used, provided that full and clear credit is given to Jan Geden and “You Betcha Can Make This” with appropriate and specific direction to the original content. Sweet Potato Corned Beef Hash on What's for Dinner Moms? Quick And Easy Baked Lobster Tails, No Lie!